The internet has become the primary medium for people to search for different types of information they seek on a day to day basis. It can be regarding a service, product, latest news related to different fields like politics, sports, etc. or any other topic of their choice. With loads of content already available on the web, content writing is now more about writing good quality content that has all the essential elements to make it stand out amongst the rest. 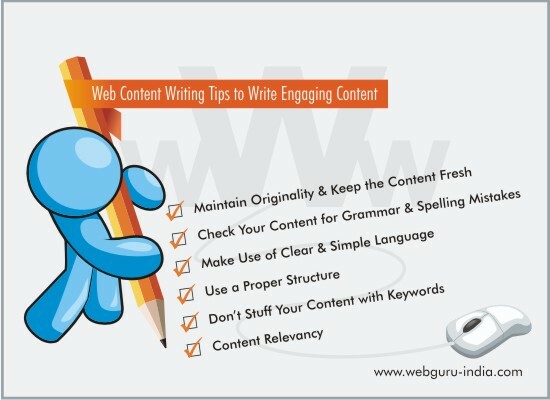 If you wish to write appealing and interesting content for the readers then, following these simple tips will surely help you a lot. It is crucial for you to keep the content fresh and unique at all times as plagiarism can ruin the reputation as well as search engine ranking of a website quite easily. Duplicate content is not at all entertained by search engines and can damage the credibility of a website and even penalize it for such actions. Original content has much higher chances of standing out and getting liked by the readers. Therefore, it is always a good idea for you to produce original, fresh web content after thorough research on a particular subject or topic. Errors in grammar and spelling can cause your readers to turn away from your content instantly. Irrespective of how much depth your content has, it is more likely to get rejected by the readers when there are lots of typos present in the content. Thus, it is always recommended to thoroughly check your content for such type of errors before publishing it on the web. Language plays a vital part on how readers perceive your content. While writing content for the web, the language should be kept simple and the message should be clear as English is not the first language of every country. Jargons and unclear expressions should be avoided at every cost as it can create confusion in the minds of the readers which can ultimately force them to look for content that is easy to interpret and grasp. When you fail to provide your content with a proper structure, readers may soon start to lose their interest no matter how much effort you put in. It is a common observance among numerous contents available on the web that, they have been stuffed with keywords simply to gain better ranking in search engine results. However, this is no more entertained by majority of search engines and can cause more harm than good to the websites. You need to make use of keywords intelligently within your contents in a natural way. It shouldn’t look as though the keywords have been stuffed forcibly simply to rank higher in search engine results. If you are writing content for any specific business website then, it is crucial for you to write content that is relevant to the business. Similarly, if you are writing a technology blog on the latest smartphones then, you simply cannot divert to the topic of how smartphone apps are creating a buzz these days. Content relevancy leads to better reader engagement as well as improved search engine results for the contents you write. Hopefully these tips will help you guide towards the right path of creating content that attracts and interests the readers. Though, the entire process may seem quite simple, but you need to put in a lot of thought and carry out thorough research before delving into a content writing project. Some useful suggestion provided for web content writers. I enjoyed reading your blog and the fact that, you have used plain, simple English to convey the exact message. Good one!! I work as a content writer and I loved reading your blog. Good suggestions which I think can benefit aspiring content writers. Awesome! This is really useful suggestions you got here. I’ll use some of them when I write my next blog post.